For those of you (like me) who like their alcohol a bit on the soft side, swimming with aromatic flavours, then you can’t go wrong with Kettle One’s new Botanicals range. Flavours such as Grapefruit & Rose, Peach & Orange Blossom, and my favourite – the subtle Cucumber & Mint (oh so refreshing, mild, and not tasting alcoholic at all) will knock your socks off with a sophisticated and fresh taste. These drinks are crafted with natural botanicals & fruit essence, with no artificial flavours, and when mixed with soda, deliver a small blip of 82 calories per serving, unlike like other alcoholic drinks (Tequila can you hear me?). But after a recent promotional night at a Kettle One event, I am a true believer and will now be a follower of the brand. I am a huge fan of fruit-flavoured drinks, but this fruit flavoured vodka has the vibrancy and bounce like being a spirit, but it is a moderate and more natural and balanced choice. But most importantly, the drinks are so delicious you will want to try all three! Hopefully not at the same time. Grapefruit & Rose is freshly squeezed grapefruit with a touch of rose (just like it says on the tin); Cucumber & Mint is also exactly as stated, and Peach & Orange Blossom is fresh juicy ripe peach with a subtle orange blossom finish. You can drinks these drinks any way you want, but for a true taste of the flavor, I recommend drinking them right out of the bottle (from a glass of course) to get the true flavour into your mouth. Trust me, your taste buds will thank you! The event I attended for Kettle One was held at the centrally-located (and fabulous) three story The White Haus on Farringdon Street right near the Holborn Viaduct. The White Haus, open for breakfast, lunch and dinner during the week including Saturdays, is a cozy restaurant/bar similar in style to a chalet tucked away somewhere in the Swiss Alps. Its vibe and decor make you feel like you are no longer in London. 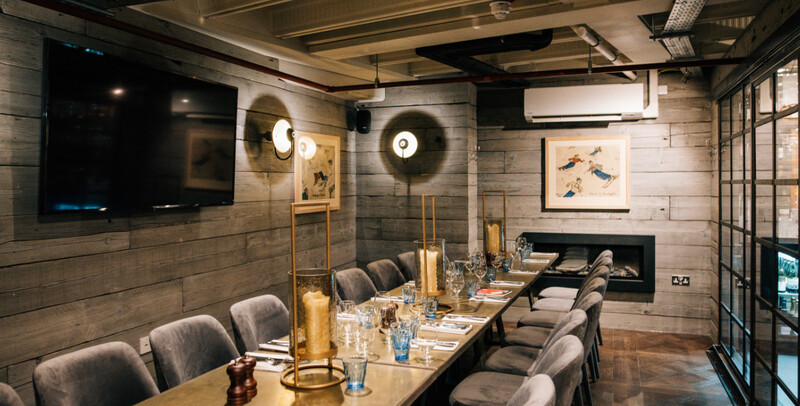 With a roaring fireplace, cosy corners with sheepskin throws, a private dining room downstairs, and a bookable cable car for six (probably the only one in London! ), The White Haus is a place that is both cool and comfortable. And the food is just what you would expect, comfort food, whether you are there for breakfast and brunch, or for a taste of their A La Carte menu (Sandwiches, Salads and Mains – Steak, Fish and Pizza), or perhaps their Saturday brunch menu or a separate Function Menu, any need you have The White Haus will cater for it. There is also, of course, drinks – Cocktails, and Hot Drinks – just like what you would want apres ski – should be enough to get you to go there. So whether you go to The White Haus for some fresh, healthy and great tasting Kettle One drinks, or for something totally different, either way, you are onto a winner. Is It a Bagel? Is It a Pizza? No, It’s the Bagelizza.